Lo Coco’s Authentic Italian Pizzeria was founded by the Lo Coco brothers after immigrating to California from Sicily, Italy. Their idea was simple – to share both their culinary and cultural heritage in their new home. 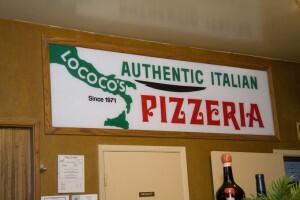 In 1971 Lo Coco’s Authentic Italian Pizzeria opened in San Rafael, California. The family-run restaurant has been a celebrated Marin County establishment ever since. Throughout the past four decades, Lo Coco’s customers and employees have become part of our family, enjoying what Lo Coco’s is best known for – our unique, light, fluffy, and flavorful pizzas as well as other menu offerings such as homemade cannelloni and fresh salads. To all of our loyal customers: thank you for your continued love and support over all of the years. And if you haven’t tried Lo Coco’s, we invite you to stop by, relax, and enjoy our delicious pizzas, cannelloni, and salads! FOOD MADE WITH LOVE TO BE ENJOYED WITH FAMILY AND FRIENDS.